We see this “Is Java out of business?” question pop up year after year. They say that Java is the least feature-rich language of the popular languages on the JVM and the slowest to move on new features in the last decade. There are also people who believe that because so many new JVM languages are being invented is proof that the Java language is lacking and that Java is no longer meeting the needs of many developers. And yet, by all external markers, Java is alive, well, and growing. 1. 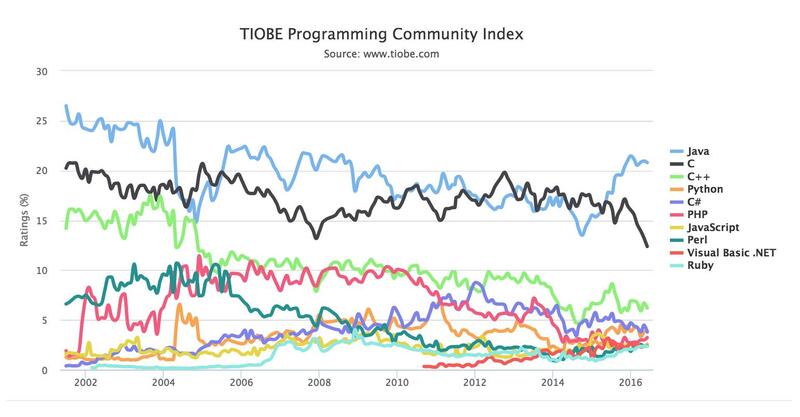 TIOBE ranked Java as its top language of 2015 currently shows it enjoying 5% growth in use since 2014, more than any other programming language. 2. 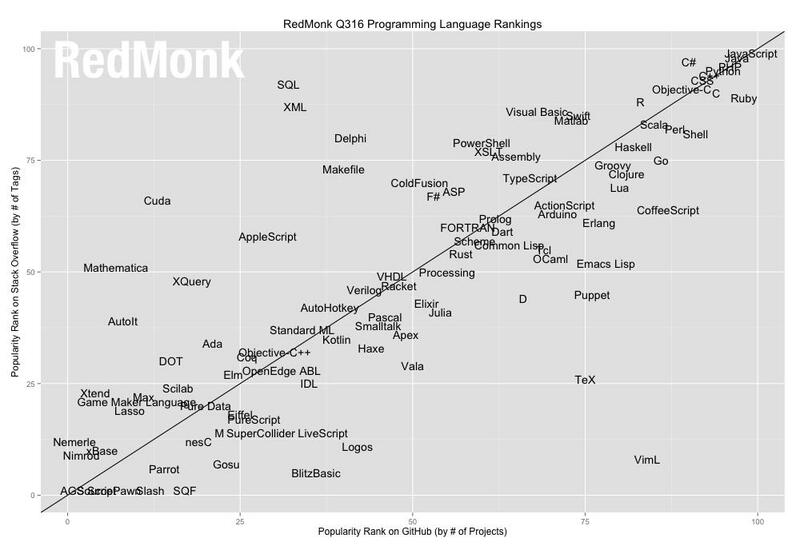 RedMonk has recently published the latest edition of its bi-annual list of the top programming languages. Compiled with the help of data obtained from GitHub and StackOverflow, this list tells us about the usage and discussion of a language on the web. 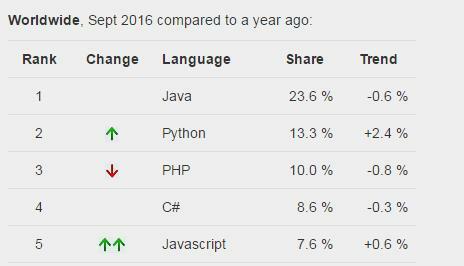 Just like the previous years Java is among the top of the programming languages. 3. Further, the PYPL Index, which ranks languages based on how often language tutorials are searched on Google, shows Java clearly out in front with 23.9% of the total search volume. Java considers security as part of its design. The Java language, compiler, interpreter, and runtime environment were each developed with security in mind. Robust means reliability. Java puts a lot of emphasis on early checking for possible errors, as Java compilers are able to detect many problems that would first show up during execution time in other languages. You generally need a strong reason to switch from a language you’re currently using: it requires time to practice and learn new languages, and you have to be confident that the language you’re considering switching to will be supported in the long term. Nobody wants to build software in a language that will be obsolete in five years’ time. 2. JVM and the Java Ecosystem. The Java Virtual Machine, or JVM. compiles programs into bytecode, which is then interpreted and run by the JVM. Because the JVM sits above your specific hardware and OS, it allows Java to be run on anything, a Windows machine, a Mac, or an obscure some flavor of Linux. The big advantage granted by the JVM is in this increased compatibility and the stability it affords. Because your application runs in the VM instead of directly on your hardware, you can program said application once and trust that it is executable on every device with a Java VM implementation. This principle is the basis for Java’s core messaging: “Write once, run everywhere.” And it makes Java applications very resilient to underlying changes in the environment. 3. Java and the Internet of Things. “I really think Java’s future is in IoT. I’d like to see Oracle and partners focused on a complete end-to-end storage solution for Java, from devices through gateways to enterprise back-ends. Building that story and making a success of it will help cement the next 20 years for Java. Not only is that a massive opportunity for the industry, but also one I think Java can do quite well,” said Mike Milinkovich, Executive Director of the Eclipse Foundation. Thus, Java might have its detractors, and some of their arguments might even be reasonable. Nonetheless Java has evolved a lot since its inception, holds the lead in many areas of software development and has more prospects for the future. So, in our opinion, its survivability is not in doubt. And what do you think? Is Java going to become one of the dead languages? Or it has all chances to survive? Feel free to share your thoughts in comments below! Java may not have all the features but there are thousands of libraries which gets the work done. Java is not growing slowly for sure but after that many years any language would saturate. After Java 9 things should change. But still a good article, thanks for the information. It has already been superseded in some areas by other languages (e.g. where web GUIs are involved, where JS and related technologies are preferred) and is not a player on certain platforms (IoS mainly) but there is probably more Java out there than COBOL and as a robust serverside platform (rather than library) with massive feature support, it will stick around for a good 20 years unless something big changes. IoT is just more of the same really – embedded Linux devices for example, well suited to small footprint JVMs, much like Android. My prediction is that quantum computing and then massive parallel processing goes mainstream and languages that harness the latter more efficiently than Java will come to the fore.